"I'm looking for a free solution to convert my edited AVI and WMV files to MOV for my video podcast. I know I can buy QuickTime Pro to save things as MOV files, but I'd rather use something free." I tend to prefer MP4 files for video podcasts because they playback more places than MOV files, but maybe that's just me. Microsoft improved this somewhat by adding MOV playback to Windows 7, however, you will still run into situations where the people who want to watch your podcast will not be able to play your MOV files. QuickTime Pro is the solution I typically use for saving other video formats as MOV. Several video editing apps, like Sony Vegas and Adobe Premiere offer the option to save video as MOV from the editing time line. If you're using something like Windows Movie Maker to edit videos, a free solution may be your best bet because QT Pro doesn't handle WMV files. 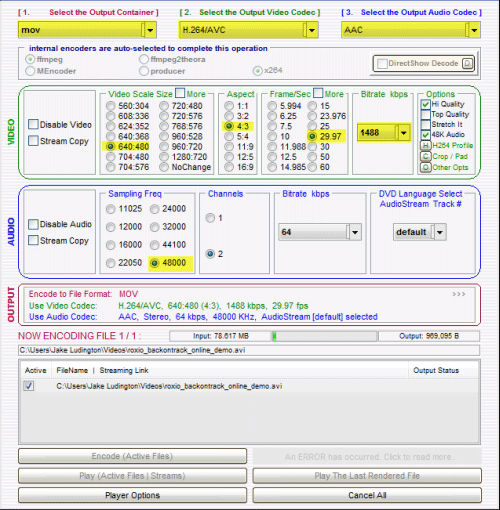 Of the numerous free video converters available, I only know of one that reliably converts AVI and WMV files to MOV format. The app you want for AVI to MOV or WMV to MOV conversion is SUPER. SUPER converts almost any format to any other format in a reliable way. My main complaint about SUPER is that the interface is highly confusing, presenting you tons of options you may not need. When you convert a WMV or AVI file to MOV, simply choose MOV in the output container section at the top of the screen. Leave the video and audio codec selections as the defaults H.264/AVC and AAC respectively. Choose the video dimensions you want, aspect ratio, and frames per second. The can get confusing, but if you want a file ready for playback on an iPod, check the More box in Video Scale Size and select 640x480, Aspect 4:3, Frame/Sec 29.97, and Bitrate of 1488. For the Audio section choose 48000 in the Sampling Frequency. There are many caveats to configuring these settings, but if you start with the defaults I suggest, you can always work toward developing your own preferences later. Add the file or files you want to convert by right-clicking anywhere on the application window and choosing Add Multimedia Files. Click the Encode button when you are ready to convert.